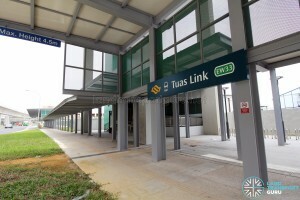 Tuas Link MRT Station (EW33) is an above-ground station and western terminus of the East West Line (EWL). 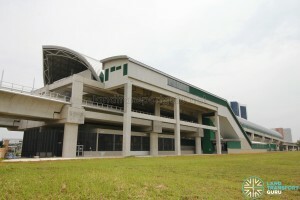 Located along Tuas West Drive, at the junction with Tuas Link 4, it also sits within the Tuas Promenade planning subzone. 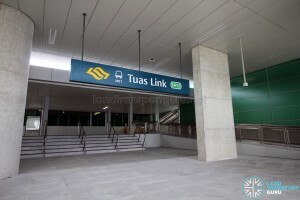 The station was constructed as part of the Tuas West Extension of the EWL, which opened on 18 June 2017. 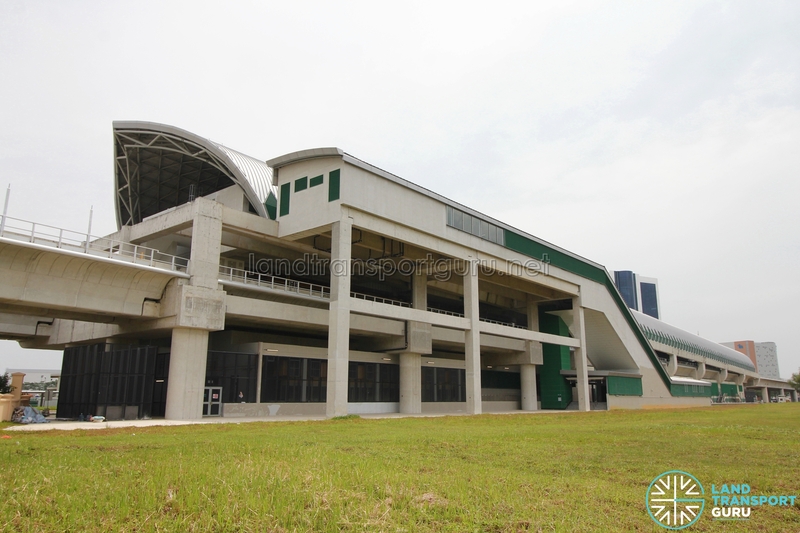 It takes its name from nearby roads of the same name, numbered from 1 to 4, which serve the Tuas West industrial area. 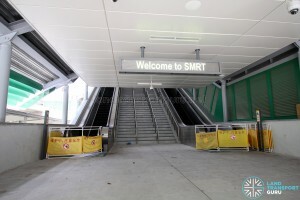 It is also the first elevated MRT station in Singapore with the ticket concourse level above the platform level. 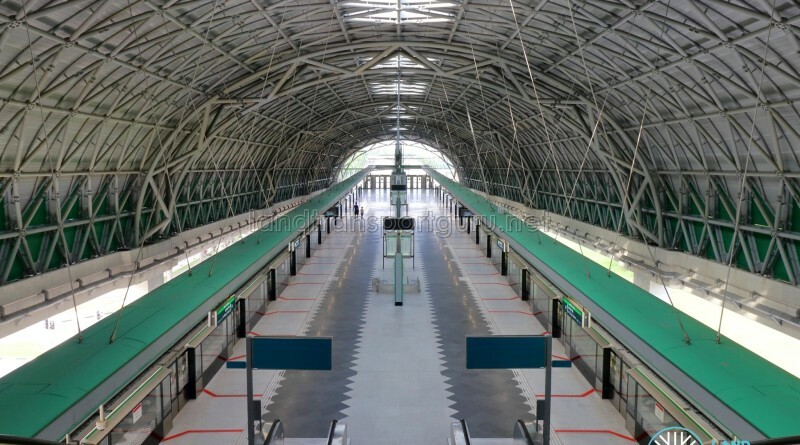 When opened, Tuas Link station replaced Joo Koon as the western terminus of the EWL. It serves industries in the vicinity of Tuas West Drive and Tuas Link 4, such as Tuas Link 1 / 2 / 3, Raffles Marina and Tuas Checkpoint. 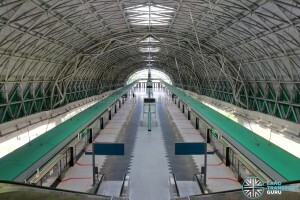 Bus services are offered from the nearby Tuas Bus Terminal, connecting to other parts of the Jurong, Tuas and Tuas South industrial areas. Although within walking distance to Tuas Checkpoint, commuters are not allowed to enter Tuas Checkpoint on foot. 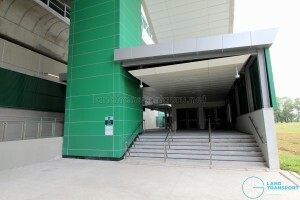 Commuters heading to Malaysia via the Tuas Second Link can board Transtar Cross-Border Bus Service TS6 from Tuas Link Stn Bus Stop (25429), or board or Causeway Link Bus Service CW7 from Opp Tuas Link Stn Bus Stop (25421). 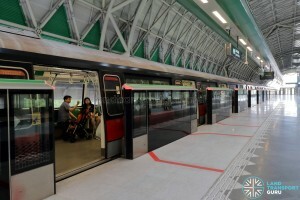 Tuas Link station has two elevated East West Line platforms in an island platform arrangement. 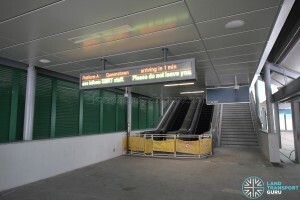 Half-height Platform screen doors are installed at the platform edge for the safety of commuters. 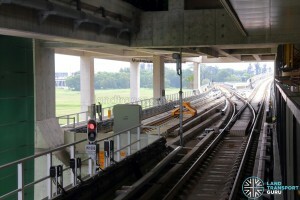 Branching off the EWL tracks are two reception tracks that lead to Tuas MRT Depot. 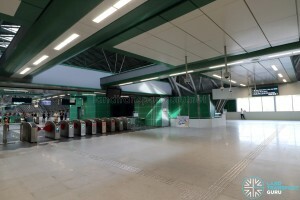 The station is built with a barrel vault roof design similar to other stations between Tuas Link and Pioneer, and many other overground stations along the Eastern side of the East West Line. 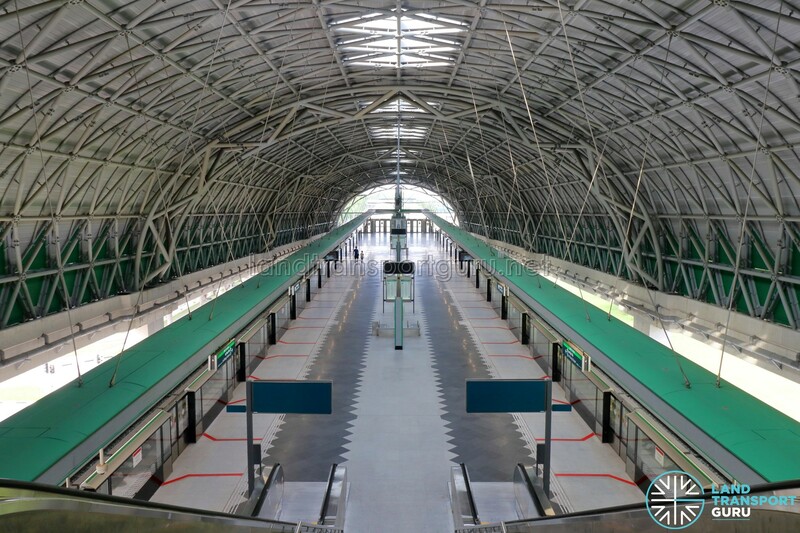 The large curved roof does away with support columns for a more specious feel and easy navigation at platform level. 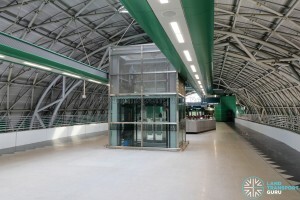 Half-height Platform screen doors are installed at the platform edge for the safety of commuters, and retrofitted High volume, low speed (HVLS) fans keep passengers cool. 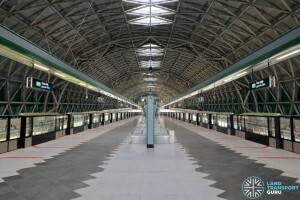 Skylights on the roof, running the length of the station, allow natural lighting into the station platforms. In certain enclosed parts of the platform, Pro-Jet fans are used instead. Passenger Information Systems, which are plasma display screens located at each platform, display expected train arrival times and key messages. Tactile flooring helps to guide the visually-handicapped from the platform to station exits. 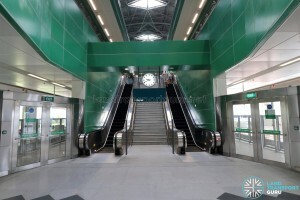 Escalators, lifts and stairs connect the Platform level to the Ticket Concourse level above. 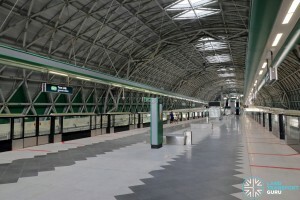 The station has a ticket concourse located at Level 3. 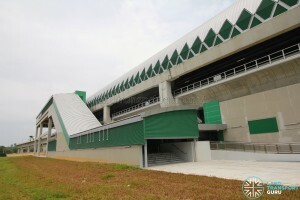 Unique to Tuas Link station, it is the first elevated station with the ticket concourse above the platform level, as the tracks descend to a lower height before entering Tuas MRT Depot. 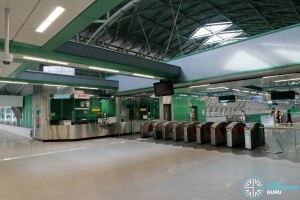 It features faregates for automatic fare collection and provides access between paid and unpaid areas of the station, with at least one bidirectional wide-swinging gate for the benefit of passengers-in-wheelchairs and those carrying bulky items or travelling with prams. General Ticketing Machines allow commuters to purchase tickets for single or multiple journeys, and along with Top Up Machines, offer contactless card transactions. 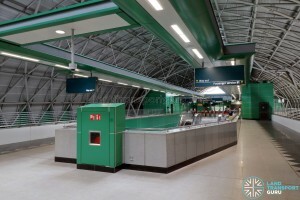 The station office functions as a Passenger Service Centre and is staffed during operating hours, where commuters may make travel inquiries or perform card transactions using cash payment. Toilets and retail shops are located in the unpaid areas of the ticket concourse. 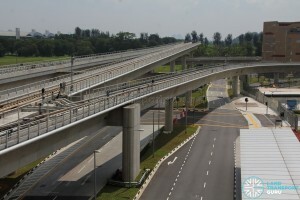 A link bridge across Tuas West Drive connects to an exit on the southbound side of the road. 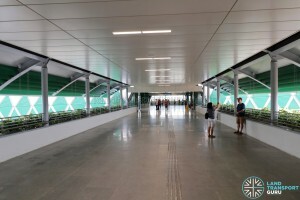 Tuas Link MRT station has a ground-level exit on both sides of Tuas West Drive, with the exit on the Southbound side of the road linked to the ticket concourse level by a pedestrian overpass. All exits offer barrier-free accessibility for the disabled. 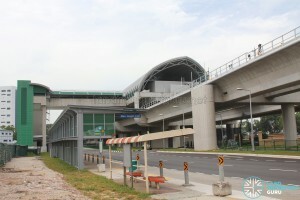 Tuas Link MRT station connects to several bus stops in the vicinity, as well as taxi stands and passenger pick-up points. 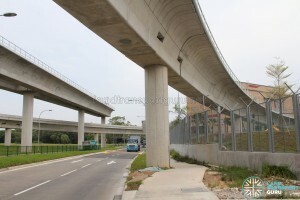 There are two bus stops officially linked to Tuas Link station. 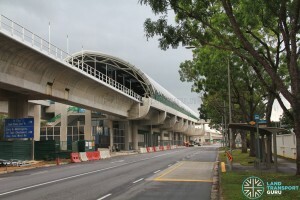 In addition, passengers can board free regular bus services at bus stops officially linked to Tuas Link station depending on the situation on the ground. 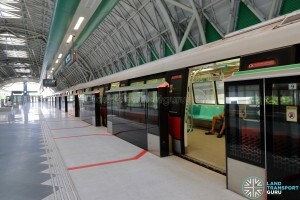 North of the station and branching off the EWL tracks are two reception tracks that lead to Tuas MRT Depot. 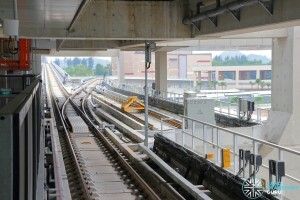 In addition, a scissor crossover is located just south of the station for the turnaround of trains. 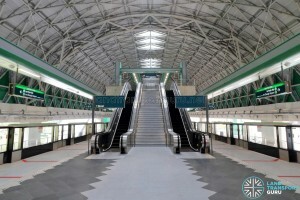 Serving the Jurong and Tuas industrial areas, the station’s demand fluctuates with the peak periods, with moderate demand at most times and high demand during the peak hours. 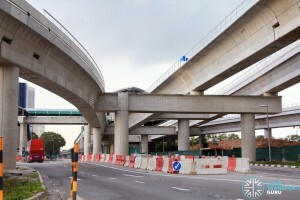 Contract 1686 (C1686) for the construction of Tuas West Road and Tuas Link stations approximately 2.2km of elevated MRT viaducts was awarded to China Railway 11 Bureau Group Corporation for S$150 million in November 2011. 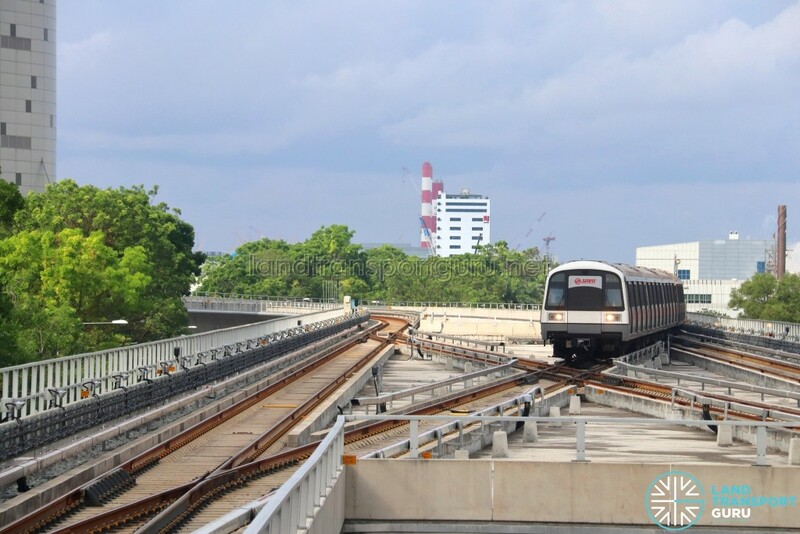 Tuas Link station was constructed as part of the $3.5 billion, 7.5-kilometre Tuas West extension, a fully elevated extension with four stations and a new train depot in Tuas. 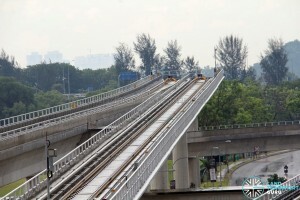 In June 2018, local Chinese publication Lianhe Zaobao reported that track circuits in the vicinity of Tuas Link were still intermittently faulty one year after the opening of the Tuas West Extension. For the three affected track circuits, the receiver at one end of the track circuit is unable to detect the signals from the transmitter at the other end of the track circuit, notably during periods of wet weather. As a result, the Operations Control Centre is notified of the fault, and temporary speed restrictions are automatically imposed on passing trains. 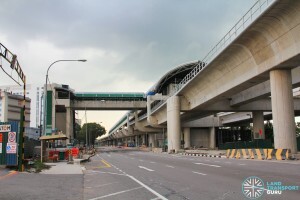 According to the LTA and SMRT, these faults were detected as early as Feburary 2017 but were not safety-critical and did not afect the line’s opening in June 2017. Since it failed to identify the cause of the recurring problem, a consultant would be appointed to conduct a detailed investigation and to propose a solution. 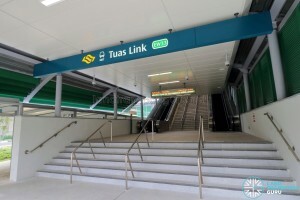 Tuas Link MRT Station Is The 2nd Terminus Station To Be Put As ‘2 Words’ After Joo Koon. So when will the causeway busses move to here to reduce the journey time and road congestion? It seems very short sighted to put an MRT stop so close to the checkpoint and then not use the benefit.